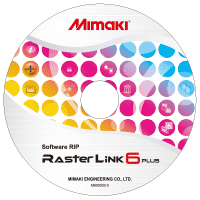 RasterLink6Plus | Software | MIMAKI SINGAPORE PTE. LTD.
Mimaki [RasterLink] is upgrading on focusing the simplicity and the user-friendliness. Newly developed [RasterLink6Plus] is equipped with more useful and advanced functions ! [ID Cut] for consecutive cutting and [Braille print] for an easy print in braille etc. Basic setting items are indicated by icons, enabling intended operations to be performed intuitively without hesitation. When clicking on the targeted icon, the screen will be changed in the same window. In addition, layout settings can be re-used at any time by implementing "Register as Favorite". When printing, you can visually confirm the job progress on the main screen. Users of [RasterLink6] can make download to upgrade to the [RasterLink6Plus] for free thru Download page of [RasterLink6Plus]. * [Windows7] or later version of Windows OS is required to support the [RasterLink6 Plus]. Please utilize [RasterLink6Plus] under the environment of OS [Windows7] or later version. Version up from [RasterLinkPro 5] or earlier versions. Version up from [RasterLinkPro 5] or earlier versions are not avaialble. We will request to purchase the [RasterLink6Plus] and install it.